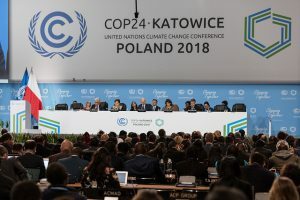 (3 December 2018):- On the opening day of COP24 in Poland ECOLISE is calling on government leaders to recognise the global climate emergency and to make decisions which reflect the urgency and gravity of the challenge it poses. In 2018 ECOLISE was the primary organiser of the second edition of the European Day of Sustainable Communities, in which communities in 24 European countries celebrated their efforts in transitioning to an equitable, post-fossil fuel society. Robert Hall also invited those attending COP24 to the ECOLISE joint event, Indigenous Peoples and Local Communities Leading the Way for Enhanced Climate Action, Showcasing Transformative Change, on Friday, 07 Dec 2018 16:45—18:15. There is now clear evidence that we are in a global climate emergency. All people – at all levels, across all sectors and all around the world – need to start acting in a way which is congruent with and proportionate to the urgency and gravity of the challenges facing humanity and the rest of life on Earth. ECOLISE is joining the many other citizens, groups, organisations, networks and institutions who explicitly recognise this reality and are demonstrably focusing time, attention and resources on finding solutions. We are calling on governments at all levels, and international institutions, to do the same. The particular piece of the solution that we offer is the power and potential of community. Communities represent a potent space where people can connect and collaborate across difference, navigate complexity and find practical, real-world solutions to systemic problems. Stay positive and hopeful, knowing that by working together we can achieve amazing things and find better ways to live now and in the future. Give voice to such communities, as a follow-up to the Talanoa dialogue process, through the declaration of an International Day for Sustainable Communities.